Amélie Poulain is home schooled by her parents who incorrectly believe that she has a heart disease. 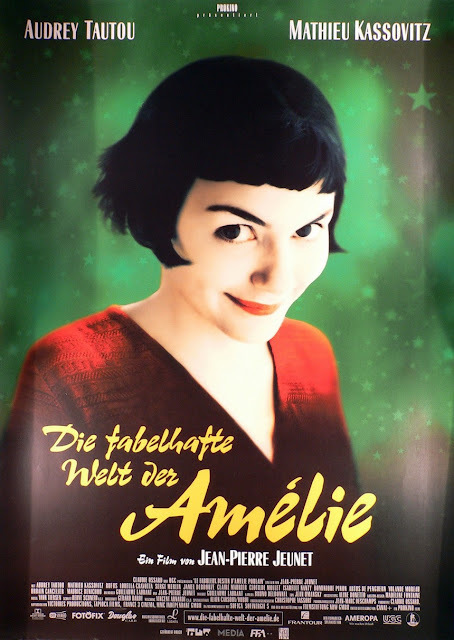 To cope with her loneliness, Amélie develops an active imagination and a mischievous personality. When she loses her mother and her father's withdrawal from society worsens, she leaves home at the age of 18 and becomes a waitress at the Café des 2 Moulins in Montmartre, which is staffed and frequented by a collection of eccentrics. She lets her imagination roam freely and learns to find happiness and contentment in small things. When Amélie accidentally stumbles upon a hidden old box in her apartment left by a boy decades earlier, she resolves to track the boy and hand it to him. She promises herself that if it makes him happy, she will devote her life to bringing happiness to others. When her plan meets success, Amélie happily embarks on her new mission to spread happiness among everyone around her. Be it escorting a blind man to the Metro station or helping her father to follow his dream of touring the world, she does it all just to see a smile on the face of others. When she meets Nino Quincampoix and realizes that she's falling in love with him, she plays a cat and mouse with him by holding on to his treasure and finally returns it to him anonymously. Soon, she realizes that her co-worker Gina seems to be interested in him too. Will Amélie, the distributor of happiness, find happiness for herself? Will this girl who lives in her own world of sparkle, find some for herself? The simplicity, the love, the acts of kindness, there is magic and beautiful fantasy in every frame of this movie. A channel used to play this almost once everyday, years ago, and that's how I first watched it. With sub-titles of course. Ten minutes into the movie and I had a big smile on my face. The story is so beautiful and it takes you right into the lovely streets of Montmartre. One of my favorite scenes is the one where while escorting the blind man to the station, she gives him a description of the scenes on the street. The description is so rich and life like that the blind man almost sees the scene in front of him. This scene is so beautiful that I can watch the movie a thousand times for this alone. The dialogues are equally brilliant. Although touted to be a rom-com, the movie talks about the closeness of human relationships and how you do not need to name a relationship to do something good for the other. Audrey Tautou sinks her teeth into the title character beautifully and breathes life into Amélie in every scene. There is a lot of fantasy in the movie, yes, the film is a whimsical depiction of contemporary Parisian life and that makes the whole movie seem magical and yet it comes alive with every scene. Everyone should watch this movie at least once, to learn about kindness, love, and yes, magic. Runners-up: Apocalypto (English), Andaz Apna Apna (Hindi), Artist (Malayalam). This post is a part of the A To Z Challenge for April, where my theme for this year is Movies I Love. Sounds like a good movie. And it will definitely find many fans in today's world where we keep running after happiness not knowing that it's really in sharing it with others. Lovely Sowmya, a rom-com with underlying message on relationships. I have noticed that most european movies have that element of laving an impact, including their so called commercial ones. Yes, European movies convey messages like no other. This is one such example. Do watch it Shalini, I'm sure you'll love it. Today, I read about this movie in another blog post. Amilie sounds such a lovely character. Would love to watch this movie, hope it's on Netflix! You should be able to find it easily online. Do watch and let me know what you feel about it. Will continue checking out the other movies in your series.. Thank you for visiting, Tina. A good start Soumya. I am definitely going to watch this movie. I felt nice just reading about this. 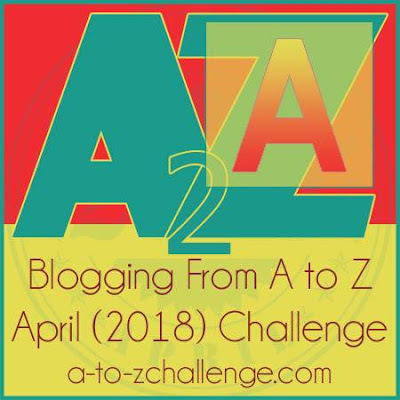 Happy A to Z. The movie sounds very interesting. I love the movies that talk about human relationships. Thanks for sharing. Do watch it, it will make your feel very good. I know I commented and clicked published, but that took me to your theme reveal post! 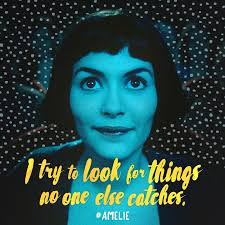 Amelie is one of my favorites! Poignant, charming and absolutely brilliant. I loved the coloring throughout the movie too! Just wow! Oh yes, the coloring of the movie was so pleasant and soothing to the eye. I had come across this movie playing on television so many times but couldn't watch it. After reading your review I think I need to catch with it soon. Do watch it, you will not be disappointed.